I have finished the big part of my screenprinting mid term. This is my fabric, i have 15 ft (approx) of fabric, and i dyed it with cochineal (a type of beetle used to replace red dye 3 in lipsticks and food) and aluminum acetate, and then printed the designs on. I then applied the devore paste onto the fabric. when you heat set it, it breaks down the cotton where you place it. it only breaks down cotton, so most of the printing is intact, and i put polyester thread through it on the sewing machine to give it structure. this is about 1/2 of the full meterage. you can really see the threads i put back and forth on the fabric here. sometimes its hard to tell what is background and what is fabric! I spent approx 20 hours doing this fabric, lets hope I don't screw up the sewing!!!! I am making a dress with it for the wearable art show AND my midterm. This post is about how to give credit to me if you use my images on anything on the internet. if you don't, its plagerism! if i have cited my work as being someone elses, simply replace my name with their name and still put a link to my website (in this case i was emailed a photo and it does not have a direct source online). Having a closet of clothes that don't fit quite right, don't look quite right, and aren't quite the colours that suit you isn't going to do you much good. Its better to downsize and have a lot of basics and things that fit well with some fun things mixed in; getting dressed isn't so much of a hassle. 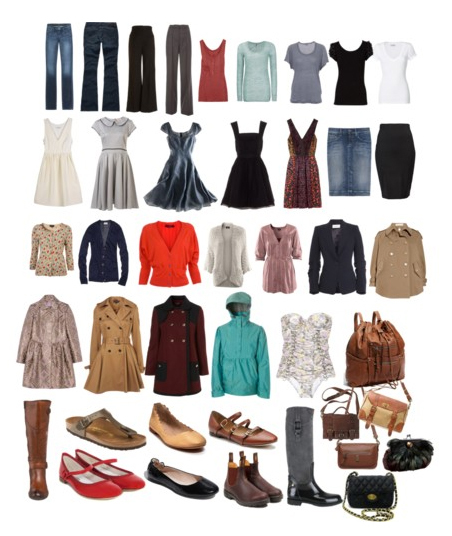 A wardrobe of individual pieces and no basics will not work, as hard as you try to make it work. Know what your strong points are, and what your lifestyle is. Dress for your climate. If you walk everywhere, getting rid of all your flats collection and replacing them with heels is not going to work. If you work in an office, downsizing on how many suits and pencil skirts you own won't do much good either. Get rid of what you don't wear, what doesn't fit and what is worn out. If you haven't worn it in the last year, you likely won't wear it for the next year (obviously excluding things like you weren't in the country for a whole season, or pregnancy). If you choose to downsize and rebuild, donate your clothes to salvation army (you can get a voucher for discounts on purchases there in the future when you bring a big bag of clothes in, and reduces landfill waste). How obvious is it that i live in Canada? -A pair of medium wash jeans and a pair of dark wash jeans. I don’t often wear lighter wash jeans because they tend to add pounds and look more casual, darker jeans always look dressier. -A tank top in a bright colour, and a long sleeve shirt, along with a black, grey, and white tshirt. When I think about the shirts I wear on a regular basis, these are the ones I wear. -Two brightly coloured cardigans, one navy cardigan, and one grey cardigan. I generally find grey easier to mix and match than brown or black. isn’t it, most of these clothes I don’t own) and is brown and belted. -A pair of comfortable flats like shoes. -Larger bag for travelling and such. Hi! My name is Katrina Craig and i live in Nova Scotia, Canada. I am originally from Prince Edward Island, Canada. 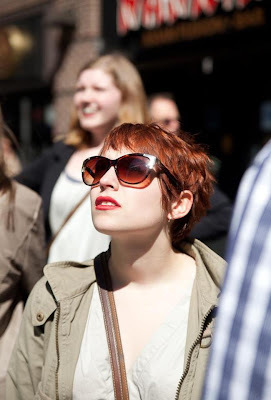 I moved so that i could attend a university for fashion and textiles. I am currently employed as a production seamstress and screenprinter, and go to school full time at NSCAD University, I graduate in 2014 (It should have been 2013 but I extended my degree a year to take a smaller course load so I could work). I started this blog so that friends and family could keep in touch with what i'm up to so i don't have to email them pictures (sorry guys). Sometimes I'll throw in some personal style blurbs or how to stuff, but in general its a lot of my school work or also personal projects (although these are few and far between except for the summer). I weave, print, dye, sew, knit, crochet, needle felt, spin wool... you name it if it has to do with fabric. I also draw and paint but not nearly as much in the last few years because school absorbs a lot of my time. 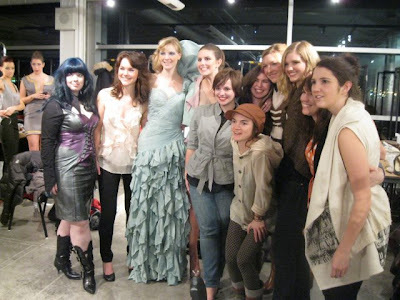 All the designers at a student fashion show "Ninety Nine Days In"